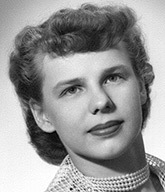 LOTTSBURG—Eleanor L. Knight, 88, of Lottsburg passed away on February 3, 2019. She is survived by her husband of 66 years, Oliver M. Knight; son, Gregory A. Knight of Suwanee, Ga.; two sisters, Anna F. Sheip of Reading, Pa., and Marian Gring of Morgantown, Pa.
A Mass of Resurrection was held at 11 a.m. Wednesday, February 6, at St. Francis de Sales Catholic Church, Kilmarnock. Interment followed the service in the church cemetery.